The FlyJSim Bombardier Dash 8 Q400 for X-Plane is 25% off at X-Plane.org. Sale ends August 21st 2011. Vidan Design has posted another preview picture from the upcoming Herning Lufthavn (EKHG) for FSX. Pacific Islands Simulation has announced the upcoming Kingdom of Tonga - 3 Domestic Airport Extensions for FSX. Freeware Bell 206B III JetRanger TV News expansion and update for FS2004 from Owen Hewitt and George A. Arana. 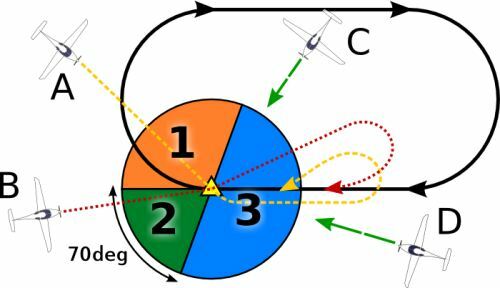 X-Plane Flight School has added the lesson X-IFR 5 - Holding Patterns in the X-Plane.org Forums. New preview pictures have emerged from the freeware Dornier Do 328 Turboprop project for X-Plane. Take On Helicopters Community Preview build 83836 is available. Note: Arma 2: Operation Arrowhead is required. OpenVFR has posted new screenshots from the OpenVFR Philippines scenery for FSX. Eaglesoft Development Group is offering 10% off with use of the Summer Saving Sale Coupon. Expires Aug 31st 2011. Skysoft Simulation has posted another preview screenshot from Hefei Luogang Intl. Airport (ZSOF) for FS2004. Eiresim has updated London Luton (EGGW) for FS2004 to version 1.2. Details in the Eiresim Forums. New runway texture previews from Aerosoft Corfu X (LGKR) for FSX has been posted. Aerosoft has posted an announcement and preview pictures from the upcoming PZL-104 Wilga for FSX. Aerosoft is offering 20% off on the PBY Catalina and F-16 Fighting Falcon for FSX. This Weekend Only. Bohemia Interactive has released new screenshots of Take On Helicopters from GC 2011. Open source flight simulator FlightGear version 2.4.0 has been released. Details at the FlightGear Website. Alexander Ther has created an unofficial promo video to the upcoming freeware Orbx Bowerman Airport (KHQM) for FSX. New beta previews have been posted from the upcoming freeware Orbx Bowerman Airport (KHQM) for FSX. Angle of Attack has announced their next Vatsim fly-in scheduled on Saturday, August 20th 2011 at 1900Z. Eiresim has updated London Luton (EGGW) for FS2004 to version 1.1. Details in the Eiresim Forums. 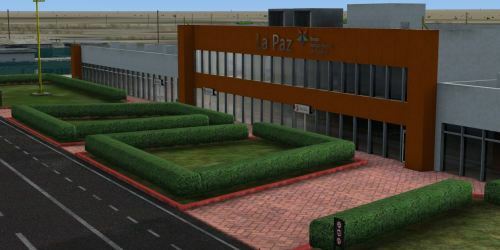 Baja Sim has posted more terminal previews from La Paz, Baja California Sur (MMLP) for FSX and FS2004. New preview pictures from the upcoming Antarctica X for FSX by Aerosoft have been posted in the AS Forums. 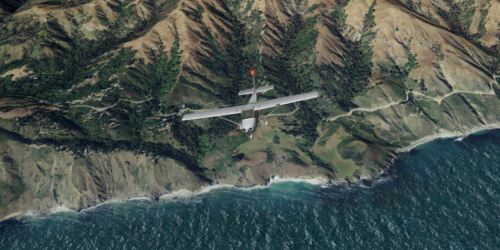 RealScenery has posted more screenshots from the upcoming Northern California photo-scenery for X-Plane. The freeware International Space Station (ISS) for X-Plane version 2 is now available to download at X-Plane.org. Bohemia Interactive has posted the Take On Helicopters GC 2011 Trailer on YouTube. 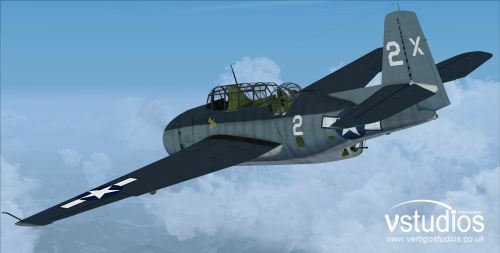 The VertigoStudios Grumman TBF Avenger for FSX is now also available at SimMarket. 3D ‘Sound Cone’ Technology with an amazing sound set, engineered using authentic Pratt & Whitney. Sound Design by Sonic Solutions featuring interior and exterior start, shut-down, wing folding, gear, flaps, canopy, wheel roll, crashes, tire touches, interior rattles, occasional sputters and back fires at certain RPM’s all in 16 bit/48k mastered for maximum dynamic range and quality. Fully operable weapons pack with multiple munitions, including guns, torpedo, bombs and rockets! 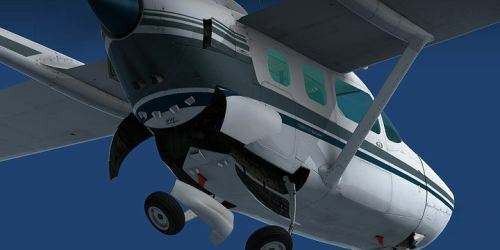 Carenado has posted the latest previews from the soon to be released Cessna C337 Skymaster for FSX. QualityWings has posted a night lighting preview video from the upcoming BAe146/Avro RJ for FSX and FS2004. Orbx has posted the first preview pictures from the upcoming freeware High River Regional Airport (CEN4) for FSX. Enigma Simulations has posted several previews of the Southwest Airlines 'Canyon Blue' Boeing 737-300 for FSX. ScruffyDuck Software has updated the freeware Airport Design Editor (ADE) for FSX and FS2004 to version 1.50. - Problem of dialog buttons being lost where users used dpi settings greated than 96. Angelo Tassoglou has released his freeware Ionian Islands photo scenery for FSX. Download at AVSIM. Ben Supnik has posted another article: The Future of Precomputation at the X-Plane Dev Blog. Vertical Reality Simulations (VRS) has posted a sneak peek from the upcoming TacPack for FSX. The SimFlight3D Classic Trainer Bundle 1958 Cessna C172 and 1947 Cessna C140 for FSX and FS2004. The Supression Flight 3D Contrails for FSX and FS2004 are now available to purchase at SimMarket. FSGuyane Saint-Laurent-du-Maroni Airport (SOOM) for FSX is now available to purchase at SimMarket. Lionheart Creations has updated the Pasped W-1 Skylark for FSX to Version 1.1. * Addition of Auto Pilot system installed, basic operation, Alt. Lock, Heading Lock. The Development Team for Zurich X Live has posted this status update on the upcoming version 2.0 update. 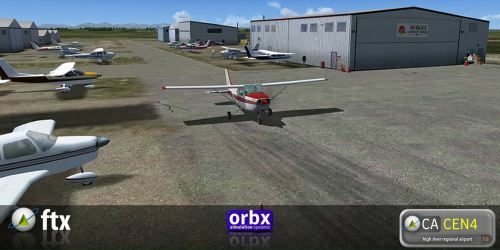 Orbx has posted the first preview pictures from the upcoming Skagit Regional Airport (KBVS) for FSX. Orbx has posted more texture previews from the upcoming FTX New Zealand South for FSX. FSDreamTeam has posted two test videos from the upcoming Los Angeles (KLAX) for FSX and FS2004. Eiresim has released London Luton Airport (EGGW) for FS2004 (FSX version to follow within 2-3 weeks). AivlaSoft has updated Electronic Flight Bag (EFB) to version 1.31 SP4. More information at the AivlaSoft Website.